While waiting for my creative juices to flow, I've decided to just share a fave recipe. Hindi madaling magluto... ng masarap! At minsan, malaki pa ang kailangang gastusin para mapasarap ang luto. Pero may isa akong recipe na patok na patok talaga! Mura na, madali pang gawin, nutritious pa! Here's a super yummy soup recipe! A hit among foodies every single time! Melt butter. Sauté leeks until limp. Add pumpkin and potatoes. Cook for 2 minutes. Season with MAGGI Chicken Broth Cube. Pour in water and bring to a boil. Cook until vegetables are tender. Remove from heat and let cool. When cool enough to handle, transfer on a blender and puree until smooth. Pass the mixture into a strainer to remove any un-dissolved ingredients (optional). Pour back soup into the soup pan and bring to a simmer. Add NESTLÉ All Purpose Cream and cook for another minute. Serve hot. 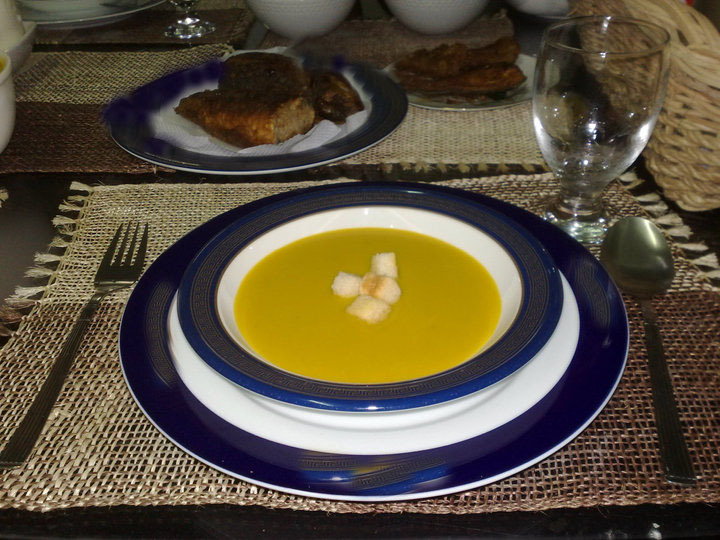 A variation would be to top it up with crispy croutons so you'll have some crunchiness that goes with the soup. Try it!!! You will never ever regret serving it!!! What quick recipes can you share? Please feel free to post below. Mombisyosa is a fifty something retiree who'd like to share her vast collection of useful life hacks, life tips and life lessons gleaned from her long years of being a homemaker, corporate manager and church worker. This blog aspires to serve as a fountainhead of a river of practical and handy information, mostly for dear kababayans.